The September 11 attacks on America and the U.S.-led coalition’s subsequent attacks on Afghanistan have forced deep historical re-evaluations of relations between the West and the Arab and Islamic worlds. People everywhere have grappled with explaining an intensely complicated situation, one fecund in historical causes and parallels that stretch at least from the European Crusades on the Holy Land during the 11th through 14th centuries to the U.S.’ establishment of permanent military bases in Saudi Arabia in the early 1990s. In this context, certain films emerge as more immediately relevant. 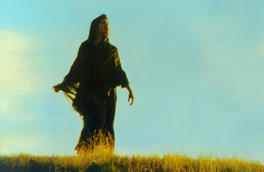 One such film is The Mad Songs of Fernanda Hussein (2001), which explores the Gulf War and its significance today through a kaleidoscope of stories and styles. The Mad Songs of Fernanda Hussein, which was made before September 11, is principally composed of three stories, all of them set in 1991 New Mexico. As U.S. troops mass in the Middle East, Fernanda Hussein (Thia Gonzales) and her two children face anti-Arab racism and vandalism, culminating in the murder of both children. Fernanda herself is Latina, and only Arab through marriage to a man who himself has returned to Egypt. But her family’s sharing of an extremely common Arab last name with that of Iraqi dictator Saddam Hussein is all the motivation their persecutors need. Meanwhile, high school student Raphael (Dustin Scott) increasingly alienates himself from his family through his open opposition to the war, ultimately moving out of his parents’ home and submerging himself in pacifist social and artistic movements. After the war, veteran Carlos Sandia (Robert Perea) returns to his home community, but is haunted by memories and unusual rashes, and tries to lose himself in alienated sexual acts. Suggestively, these stories are set in the desert landscape of the southwestern U.S. state of New Mexico. This setting is not motivated by familiarity or ease on the part of the filmmakers. 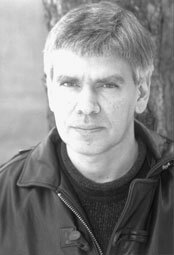 John Gianvito, the writer, director, co-editor, and producer, who also plays a supporting acting role, was born in New York City and has long lived in and around Cambridge, Massachusetts, where he is Associate Curator of the Harvard Film Archive. Instead, the setting is motivated compositionally by the desire for the deserts of Iraq and New Mexico to make a sort of comment on each other, with the banal daily violence in New Mexico providing a deflected view of the hidden wars of Desert Storm. This commentary through setting culminates boldly and suggestively in the final sequence, depicting a communal burning at the stake of a gigantic ogre puppet, who taunts the audience and then is engulfed in flame. This final sequence also culminates the stylistic heterogeneity of the entire film. For the most part, the three main stories are shot in a relatively conventional fictional style based on steady long takes and continuity editing, though occasional inserts present Carlos’ memories of atrocities he witnessed and committed in the Middle East. These sections are forged together through a panoply of alternative devices. The film is divided into sections with titled chapter headings that include quotes and the painting The Young Martyr by Paul Delaroche (1855), which visually rhymes with some of the action in the film. One of the sections, called “Orphans of the Storm,” begins with an iris as a visual pun juxtaposing people affected by Operation Desert Storm with the film Orphans of the Storm, directed by D.W. Griffith (1921), which features many irises. The Mad Songs of Fernanda Hussein also includes several scrolling titles presenting facts related to the war, documentary images of Iraqi musician Naseer Shemma playing in Cambridge, and montages of military toys and other war-related merchandise. The final sequence itself is a rapidly cut together sequence of handheld home-movie style shots, featuring actual spectators to the burning of the ogre puppet. The lack of explanation for what precisely is happening and why in this final sequence makes it the boldest aspect of what is already an impossibly bold film. For while the film to this point has been heterogeneous in style, what is happening and why on the screen, and how that is connected to the Gulf War, remains strongly self-explanatory. However, with this sequence spectators are left without any immediate link to the Gulf War, save for the presence of Fernanda and Raphael, and either have to write it off as some atrocity or come up with some associative explanation of their own. As such the sequence serves as a sort of catharsis, and forces speculative intellectual activity by the spectator, which Gianvito no doubt hopes will continue after the credits roll. Ray Privett and John Gianvito spoke at the Chicago International Film Festival in October 2001, as the U.S. bombed Afghanistan. The film has subsequently played at venues including the Thessaloniki and Rotterdam Film Festivals, the Infinity Film Festival in Italy, and several cinémathèques across the U.S. It has upcoming dates at the Munich Film Festival in June, and the Brooklyn Academy of Music in July. Gianvito’s most recent work is a short experimental piece on the events of September 11 2001. Ray Privett: Where did The Mad Songs of Fernanda Hussein come from? John Gianvito: I suppose equal parts rage and despair I carried within me during and following the 1991 Persian Gulf War. Rage that once again America was contributing to acts of great death and destruction internationally, and despair that there was seemingly so little one could do to derail the incidents. Cumulatively, following the war, as I became more and more cognizant about what had actually unfolded during those two months, of what had been kept out of the press, information that I was learning via alternative press sources and through conversations with Gulf War veterans, including some who were students of mine, those emotions became almost paralyzing, making me almost inarticulate with a rage that I didn’t know where or how to direct. So consumed was I with emotion that it became transparent that the only way to release it creatively was by making a film. I felt that in a tiny way such a film would be my contribution to the cause, to help keep alive the memory of this time that it seemed we wanted to quickly put behind us, but the consequences of which were still unfolding, and still are unfolding. RP: What do you see those consequences as being? JG: The consequences are multiple, and extend far beyond the parameters of my film or my knowledge. Certainly one of the most dramatic consequences is the ongoing impact of U.S. and British sanctions upon Iraq, which, according to UNICEF reports, have resulted in the death of over five hundred thousand children since the war. This is because of a lack of medicines and essential supplies due to the U.S.-led blockade, and because of the doubling of cancer rates due to depleted uranium spread throughout the country by U.S. weaponry. Moreover, the Iraqi peoples’ way of life and very survival have been profoundly affected by the illegal no-fly zones that have been imposed not by the United Nations but by the U.S. and Britain, both of whom continue to regularly bomb parts of the country. That’s part of it. Then, in my experience with veterans, I found nearly universal evidence of varying forms of what has come to be called “Gulf War Syndrome.” I interviewed about 50 veterans as I was constructing the character of the veteran. Only two of them did not speak of Gulf War Syndrome. People complained of unexplainable rashes, dizziness, chronic diarrhea, memory loss, loss of smell, and various kinds of post-traumatic stress syndrome, including inability to keep a job, and more. Beyond that, I feel that to some extent the Gulf War is like this monster in the closet that we don’t talk about, but about which somehow in our conscious or unconscious minds we carry a lot of shame and unresolved feelings. And I think people know that. The rapidity and intensity with which it unfolded and the rapidity with which it vanished left the country traumatized. And unless we face up to and examine those traumas, we will continue to behave in more and more wounded manners. RP: So you addressed these issues through these different stories. JG: I was interested in people who were very far removed from the levers of power, but who were nonetheless affected by these events, and who were struggling with how to affect change within themselves and the world around them. These are people who aren’t necessarily connected to organizations that have other forms of support to deal with what was going on. I was very sensitized to the rise in anti-Arab racism that was happening in many places throughout the country. I also felt that the jingoistic rhetoric that was so prevalent throughout the Gulf War and our very undertaking of the war were themselves manifestations of racism. War is easily fought if you can perceive the enemy as somehow other, somehow less or different than you. Many of the ways that the media and popular culture depicted Iraq reinforced those stereotypes rather than humanized Iraqi forces, which would have at least given us some understanding of why they did what they did. I recall during the Gulf War I felt that I was choking on the hypocrisy between what we were told were the reasons for the war and what the actual reasons obviously were. For anyone to boldly declare that this was a war fought for humanistic values and to support the noble principle that sovereign borders are sacred and shouldn’t be overrun by any other country was just absurd. America has frequently supported similar underminings of sovereign governments. Depending on how far back you go, and setting aside the obvious example of the Native American genocide, there is the 1893 invasion and eventual annexation of Hawaii; the 1953 CIA-led overthrow of Premier Mossedeq in Iran; followed the next year by the 1954 CIA-led coup in Guatemala, overturning the first democratic government in Gautemala’s history (repeated again in 1963 by Kennedy); the 1973 overthrow and assassination of democratically elected Chilean president Salvador Allende; the unprovoked attacks upon Vietnam, Cambodia, and Laos through the period of the Vietnam War; the illegal mining of the harbors of Nicaragua in the 1990s; and on and on. There is similar hypocrisy among those who declare that the Gulf War was fought in defense of human rights. Saddam Hussein’s human rights record was very well known before the war, but we did nothing then. After he gassed the Kurds in Halabja in 1988, not only did we continue supporting Hussein, we increased our support for him. So in any way to suggest that anything he did to Kuwait was a motivation for us to go in there was ludicrous. To perceive the defense of Kuwait or Saudi Arabia as a battle in defense of freedom and democratic ideals is evidence of how effectively indoctrinated one can be. Clearly, the real reasons had everything to do with maintaining control of the energy resources in the Middle East, and with reinforcing the lesson that the world is ruled by force, our force, and no one should forget it. The conglomerate of all this mythmaking, night after night, was enough to drive one crazy. But let’s get back to the construction of these three stories. On the first or second page of my notebook of ideas for this film, I wrote the title The Mad Songs of Fernanda Hussein. I don’t remember thinking of it; I just wrote it. I thought that having a character who is not Iraqi, and not even American-Iraqi, and who is only Arab through marriage to an Egyptian man, but is nonetheless the target of blind hatred, indicated the absolute absurdity of the situation. So Fernanda Hussein just showed up and that arc developed very naturally. Also, as I said, I had students who were veterans, and I saw the aftermath of the war in their lives. I thought it was important to address the fact that while many people perceived the Gulf War as a very short, clean, air war, in which there were very few casualties – only 120 or 140 Americans died, mostly by friendly fire – the situation was much more complicated. And, to this day, more and more continues to come out about the ongoing impact of what happened during those months. The third story was the most autobiographical one, built in part around my own struggles with my family and their abnegation of any feeling of responsibility. Throughout this period I was seeking to find some useful place for my anger, and in the process was trying to learn something from my elders who had made life-long commitments to working for social justice. So to some degree I see myself in the character of Raphael and identify with his struggle with how to break through to people who don’t share your point of view. I still wrestle with this. RP: It’s interesting, then, that you yourself appear in the role of his teacher who collaborates with him in his work against the war. That makes the autobiographical and didactic aspects of the film explicit. Tell me about the structure and some of the motifs, including the use of the painting and the chapterizing. JG: A lot of that was done very intuitively. I’ve learned to trust my intuition, and to believe that if it feels right, it will be right. I don’t have an explanation for all of that. The chapter headings also came very early on, and I don’t really know why they’re there. Even though the script is only about 48 pages, I knew that it wasn’t going to be a minute per page, as they teach you in screenwriting classes. I didn’t know it would be quite as long as it ended up being – 168 minutes. But I suppose I thought by dividing it into three parts, by having these caesuras, it would rhythmically help one through the trajectory that I had developed. It just worked for me, and I hope it does for other people as well. The painting was something that I discovered on a woman’s wall the very first day that I was in New Mexico. I asked what it was, and I wrote it down. I didn’t know how I would use it, but I was interested in the image. I came back to Boston a few weeks later, and a friend who had just returned from a trip to Paris sent me a copy of that exact same painting, saying it was his favorite painting in the Louvre. I had previously never encountered the painting at all. It’s called The Young Martyr, and it’s an image of an innocent who is bound and thrown into a river, but still is somehow redeemed. It seemed to relate to the themes of my film, and I found a way to use it. JG: – dumped into the Rio Grande at the very beginning, right. Just as an aside, originally, in the very first shot, which has been cut out of the film, you saw the man knifing the boy, so that the knife was in the side of his neck. We had a very good Hollywood special effects person, and I wanted to start the film with the gravest image I could muster. But it turned out to be too intense for most people, so I cut it out. RP: Why did you set the film in the New Mexican desert? JG: I had traveled in and around New Mexico a few times over the years, before I had the idea to make a film there. It’s an intensely charged landscape, staggeringly beautiful, and yet often one feels all kinds of undercurrents of violence somehow present in the terrain. Killings happen there regularly. A body was pulled from the river at one of the places I was staying about a week after I left. One also has an awareness of this landscape having been inhabited by a population that is virtually invisible now: the Native American population. Somehow, that’s always lingering in the background when you’re there, and I wanted that resonance in the film. There were other rational and irrational reasons behind my selecting New Mexico. I visually intended to rhyme a desert that was being spoken of but never seen. I was also aware that New Mexico has an extensive military history. A huge number of veterans of World War II, particularly from the March on Bataan, came from New Mexico. And then there are the military installations at Los Alamos and Trinity. In terms of the Gulf War specifically, more veterans in proportion to the population of the state fought in the Gulf War than from any other state. But beyond that, something within New Mexico spoke to me, and told me to go there. I listened to that voice, trusted it, and didn’t question it. Perhaps that explains a lot of the enigmatic synchronicities that unfolded during the making of the film. For example, one day a gentleman showed up wishing to volunteer on the film. I thought perhaps he might be able to help me locate a few locations I’d yet to secure. I told him I needed to find a space suitable to transform into the psychic’s apartment as described in the script. I read him the brief description, which said that the woman lived “in a small dark room, with strange masks on the walls, dolls with broken arms, and live birds flying freely about the apartment.” Suddenly this man’s eyes opened wide. He asked if I knew Georgelle, a psychic who reads regularly in Santa Fe. I didn’t. “Well,” he said, “you’ve just described her apartment.” And when I later met her she, too, couldn’t believe I’d written this without knowing her. And the room in the film is exactly as she inhabits it; we changed nothing, and it perfectly matched the description. I’ll tell you one more story, but there a half dozen other examples. For a long time I was looking for a location for the sequence where the children’s bodies are finally found at the edge of a riverbank, and you can see a candle-light procession heading to pay vigil near the children. However, almost everywhere in New Mexico, even in the driest areas, at the bank of rivers one always encounters this very tall grass – bosque they call it. I didn’t want to uproot the environment, so I kept searching for the location I had in mind. The first summer we skipped this scene. When I returned for the winter shoot we again scouted for this location but to no avail. The final summer’s shoot arrived and I still hadn’t found a location. I thought this was perhaps fate telling me to rethink the image, as often happens. But I was stubborn about it. One afternoon the New Mexico Film Commission drove me out to a Native reservation north of Santa Fe. We discovered one place that could possibly work, but wasn’t my ideal. I asked them what the scenery was like on the opposite side of the highway we’d just crossed. They weren’t sure, but said we had time to look. As we drove there I soon came upon the location you see in the film. Within a minute of getting out of the jeep I knew it would work. The day arrived for us to shoot this scene just after the sun set. When the shooting was over one of the crew members came up to me. He told me that while we were filming he was approached by a local Indian man who asked him what we were doing. The crew member described the sequence to him and he quietly nodded his head. Then the man mentioned that at the very place we were filming, four years earlier his niece had been pulled from the river. She hadn’t just drowned; she had been murdered. Four years earlier also places it in 1991, the time of the Gulf War. All of us had goosebumps when we heard that. The effect of all these events was some sort of feeling of assurance that for whatever reason I was on the path I was supposed to be on. RP: Tell me about the final scene, which is set at a massive outdoor festival. JG: After I had been in New Mexico for a while, someone told me about this ritual that happens every fall called Zozobra. It’s a Spanish word that roughly translates as unease, uncertainty, or gloom. Once a year, dating back to the 1920s, a giant effigy is burned to kick off a three-day fiesta. The local population refer to him as “Old Man Gloom.” The fiesta itself dates back to 1712. I started researching Zozobra, and was drawn to a documentary called Gathering Up Again: Fiesta in Santa Fe by Jeanette DeBouzek (1992), about the history of the festival, which taught me a lot. It’s important to see Zozobra as umbilically linked to the fiesta of Santa Fe, because that fiesta is the oldest annual civic event held in North America that still takes place. Ostensibly it concerns the peaceful coming together of the disparate populations of the state of New Mexico: the Anglo, the Hispanic, and the Native American. The actual history is more complex than that. When the Spanish first entered Santa Fe territories, they were repelled by the indigenous population. In history books, that’s referred to as the Pueblo Revolt, and is considered the most successful organized Native American rebellion in the New World. For 12 years, the Pueblo tribes around Santa Fe recaptured and held onto Santa Fe territories. Following that, a fellow named Don Diego de Vargas, who there are many statues of and streets named after in Santa Fe, led the Spanish back into Santa Fe, and did in fact negotiate a peaceful reentry into the city. But what is forgotten is that within a year, many of the Pueblo were dissatisfied about how the Spanish were exploiting their crops. A lot of blood was shed in order for the Spanish to remain there. So it wasn’t by any means truly a peaceful coming together. And, to this day, though it is not much commented upon, the remaining Native population rarely participates actively in the fiesta. So what fascinated me was not only the pure power of the visual spectacle of this burning effigy, but that I found something within the local landscape that could serve as a corollary to what was for me the insane, frenzied fervor that erupted during the Super Bowl stadium, Schwarzkopf-led, all-star celebrity celebrations that took place in the months following the Persian Gulf War. Being in the midst of thousands of people all chanting, “Burn him! Burn him! Burn him!,” many of them drunk, all worked into a frenzy to see this ogre go up in flames, was for me a deeply unsettling experience. And I know that there are many other people in New Mexico who will not attend the events for similar reasons. I also learned that during World War II, Zozobra was dressed up to look like Hirohito one year, Mussollini another, and Hitler a third. So it has all sorts of historical and political resonance. But for some people the image is redemptive, and they find some sort of catharsis in it. Like any poetic image, it has to be open-ended, and all the things that I’m saying are interesting to know about after the fact, but aren’t present in the film. I hope that its artistic rightness is found in some different way by each person. RP: How do you feel about the recent attacks on the World Trade Center and Pentagon, then the U.S.’ own actions against Afghanistan? And how might the film be relevant in this context? JG: Tragically, the film is as relevant as ever. Once again, we’re seeing a huge rise in anti-Arab racism, worse than we saw during the period of the Persian Gulf War. I’ve researched a lot on anti-Arab racism in 1991, and as far as I know there were no fatalities. But three weeks after September 11, there have been at least five hate crime homicides, and countless incidents of harassment. We are again using overwhelming military might to resolve a conflict, though in this case it’s not really a dispute. At the very least, the Gulf War was clearly motivated by some sort of dispute. The current attacks, on the other hand, seem fundamentally motivated by vengeance. And, again, the situation is ripe with all sorts of hypocrisy. The Taliban and Osama bin Laden were trained by Pakistani intelligence operatives supported by the CIA during the war between Afghanistan and the Soviet Union. A lot of the misery in Afghanistan that made the country susceptible to radical fundamentalist takeover could have been avoided had the U.S. put some of its enormous wealth into rehabilitating the country following the expulsion of the Soviets. Then there is the utter-unwillingness to present even a corrupt and despotic regime such as the Taliban with the evidence against Osama bin Laden that we did present to Vladimir Putin, Tony Blair, Jean Chretien, and other national leaders, telling them that they didn’t need to have the evidence and should just do what we say no matter what. Perhaps showing them the evidence wouldn’t have changed their reaction, but it would change things internationally to show that we tried to resolve this as human beings. Similarly, we went ahead building a coalition, though such a coalition already exists: the United Nations. We refuse to allow such very difficult problems as international terrorism to be attended to by an international organization that already exists to deal with them. Like during the Gulf War, today there are a lot of deep, painful, frightening ironies that leave us all with every reason to be extremely concerned about tomorrow.